2016 ARC awards luncheon. This year's ceremony is at 11:30 a.m. on April 4. The Women & Automotive awards luncheon is at 11:45 a.m. on April 5. Photo by Jonathan Fredin. Beyond the educational sessions and networking with peers in the Canadian automotive space, one of the highlights of the Auto Remarketing Canada Conference and the Women & Automotive: Canadian Leadership Forum is our annual awards. It’s the chance to recognize some of the many folks in the industry who are making an impact and continuing to emerge as leaders. 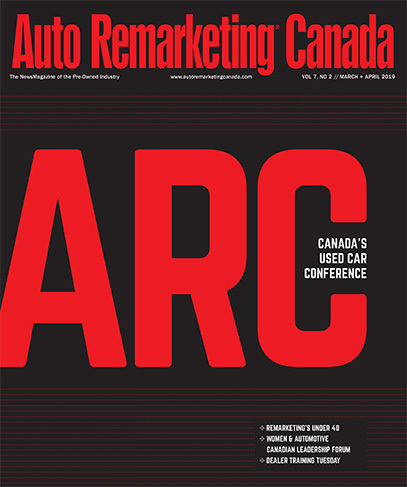 Here is a rundown of the awards and honorees that will be spotlighted during the Auto Remarketing Canada Conference luncheon and awards ceremony, which is at 11:30 a.m. on April 4. “Alan is the perfect representation of the type of leader and innovator that our industry needs. His ongoing passion for team building as a step toward growing successful businesses continues today to help make positive change in the automotive space,” said Brad Rome, president of Canadian Black Book. Joey Cappello, Autonum Capital Inc. Meanwhile, the luncheon and awards ceremony at the Women & Automotive: Canadian Leadership Forum will take place at 11:45 a.m. on April 5. During that session, we will recognize the 15 women highlighted in our Women & Automotive: Profiles in Leadership features.